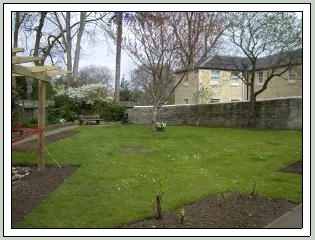 The Anniversary Garden is a small green open space situated in Eccles Court which runs between The Ferns and The Chipping. 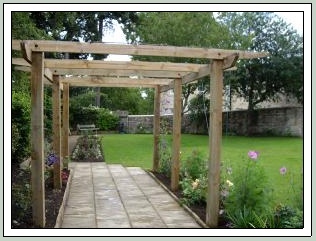 It was originally part of the grounds of Sir William Romney’s school, Long Street which is now the present day doctor’s surgery. 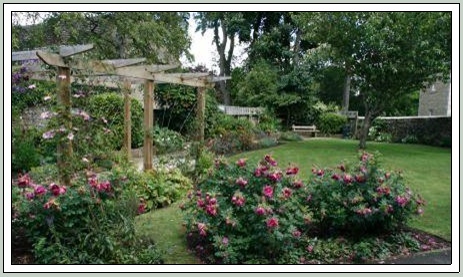 In 1977, after the school grounds had been sold to developers for housing, this small area was developed into a garden by Brigadier Meyrick Nielsen, the founder of the original ‘Tetbury in Bloom’ to commemorate The Queen’s Silver Jubilee. 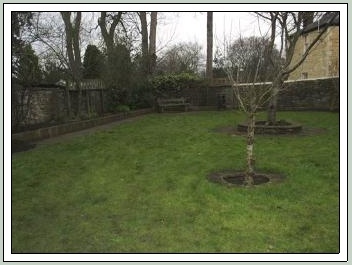 Over the years, the garden became sad and uncared for so in 2007, to commemorate its 30th anniversary and to mark the 80th birthday of HM The Queen, The Civic Society decided to fund its make over. 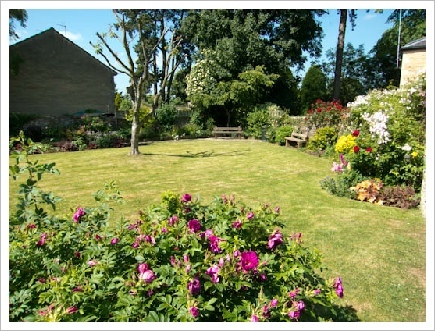 In 2007, Eric Simpson, member of both Tetbury in Bloom and the Civic Society took it upon himself to redesign and almost single handedly do the work. 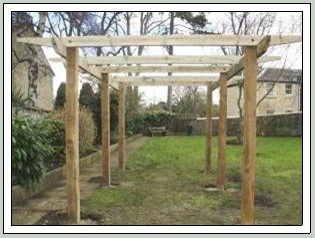 Keeping much of the original design features he set about transforming it into a sensory garden. 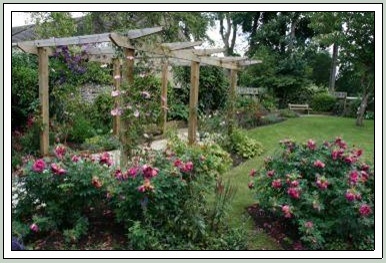 He built a new rose arbour, dug new beds and planted over 50 new rose bushes chosen for their fragrance together with many perennial plants. 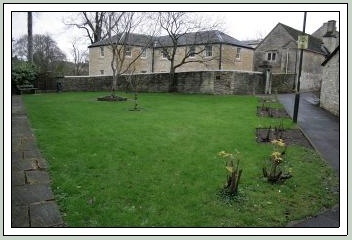 The old broken paving and walls were taken away and the bare area returfed . 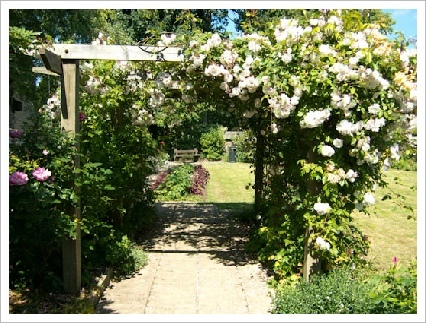 The neglected 7’ high, overgrown rosa regosa bushes that formed a visual barrier between the path and the garden were given a severe pruning that kick started them back into life with luscious new growth. In Autumn several hundred bulbs were planted and the whole project was deemed a great success. 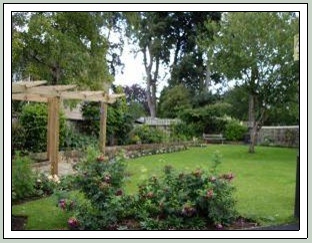 The gardens now look as though someone has ‘switched the lights back on’, it is well cared for and totally rejuvenated! The ‘before’ picture showing a very tired & sad looking area. stage one of the ‘makeover’ is completed. which were cut back almost to ground level, now full of new growth and flowering freely. One year on in 2008, everything was doing well and in Spring 2009 we added to it with more perennials in the beds. Since that time, like all gardens, things have moved on. A second bench was installed and in 2012, we gave the formal beds a bit of a makeover. In 2013 the lavenders were removed as they'd become far too leggy and were replaced with hardy fuchsias which complimented the white Japanese anemones and the red leaved heucheras. In the rosa regosa bed, snowdrops and were planted amongst the veronica border together with 750 Tete a Tete bulbs going through the centre. The results in Spring 2014 were stunning and made a very welcome splash of early colour to what had been a very wet and gloomy winter. Like all gardens, they constantly evolve. The formal beds now have slightly different look. Instead of the veronica border in the rosa regosa bed, we’ve now changed that to lavender ‘Hidcote’, which can withstand more pruning than a lot of other varieties, thus keeping it much bushier and less straggly.. The bed leading from the pergola has now been planted with 4 large Box balls, interspersed with hardy fuchsias, japanese anenomes, euonymus and heuchera. In 2018 a third bench was also installed and the town council granted funding for the old broken side path to be relayed. 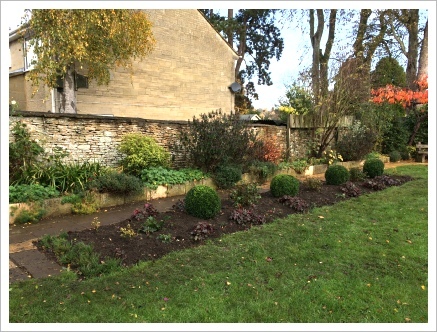 We also installed metal edging along each of the beds so that the grass edges can be kept looking much crisper and tidier.